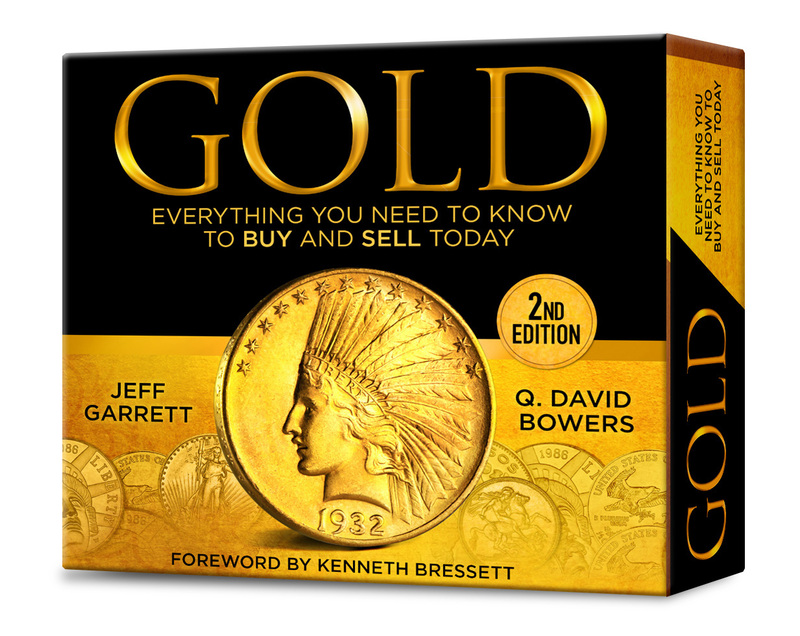 (Pelham, Alabama) — On the Fourth of July, 2017, Whitman Publishing will release a newly updated 2nd edition of its award-winning book GOLD: Everything You Need to Know to Buy and Sell Today, by Jeff Garrett and Q. David Bowers. It is available for preorder online (including at www.Whitman.com) and will be sold at bookstores and hobby dealers nationwide for $14.95. The uniquely formatted 120-page hardcover book comes in a sturdy library-quality slipcover. Inside, the text and illustrations are accompanied by pullouts printed with valuable insider information. These include technical content such as weight conversion tables, bullion-value charts, melt value by karat and pennyweight, and federal coinage specifications. “These pullouts are handy for taking to coin shows, pawn shops, flea markets, and other places where gold is bought, sold, and traded,” said Whitman publisher Dennis Tucker. They also include fascinating replicas of historical documents such as President Franklin Roosevelt’s executive order 6102 of April 5, 1933, which recalled billions of dollars worth of gold coinage and stopped the hoarding of gold coins, bullion, and certificates during the Great Depression. The book’s audience includes experienced coin collectors and investors, as well as newcomers who have never bought or sold gold but are interested because of mainstream news coverage. It covers the history of gold going back to ancient times; market trends since 1933; U.S. and foreign gold coins; modern and older bullion and trade coins; scrap gold, jewelry, and gold works of art; how to grade gold coins; the pros and cons of various buying and selling venues; using the Internet; pennyweights, karats, grams, fineness, melt value, and other technicalities; the market effects of recent world events; contact information for world mints that sell gold; and more. The coauthors are award-winning numismatic researchers. Q. David Bowers is a coin dealer, auctioneer, and writer who serves as numismatic director for Whitman Publishing and research editor of the Guide Book of United States Coins (the best-selling “Red Book” annual coin-price guide). Jeff Garrett is known as a coin dealer and an active hobby promoter; he is the president of the American Numismatic Association and valuations editor of the Red Book.